Stainless steel pole with variable height adjustment. Swivel castors with brakes. The angle of the radiant box can be adjusted, 5 blue lamp tubes - 20W for each. LCD display Timer for recording treatment time and tube life. 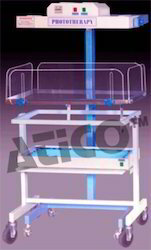 Radiant box, pillar, lift pole, stand. Department of Paediatrics provides comprehensive health care to children from neonates to young children. The department has a well equipped Neonatal ICU, managed by qualified nurses, duty paediatricians and backed by highly qualified consultants, neonatologists and paediatric surgeons. Extremely high output lets you treat the most difficult areas quickly and effectively. 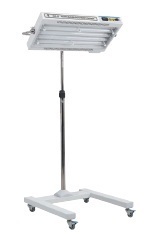 The Hand/Foot II can be ordered with UVA, UVB or UVB Narrow Band lamps. Localized Psoriasis, Vitiligo and Eczema can be cured with the help of MULTICLEAR - A TARGETED PHOTOTHERAPY MACHINE, which emits Ultra Violet A & B, lights in high doses. This light only targets affected area and thus sparing the normal parts of body, to achieve outstanding results. Phototherapy involves the use of a medical device that emits ultraviolet radiation to treat jaundice in neonates.